Improper installation can render your radiant barrier insulation ineffective. Make sure you hire the right guys to do the job for you. 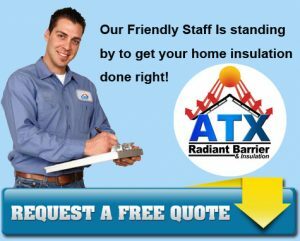 ATX Radiant Barrier & Insulation offers top of the line radiant barrier insulation services and installations. Click on any of the links below to see the detailed services we offer. Blown Fiberglass Attic Insulation : Choose from fiberglass insulation, open cell spray foam insulation and closed cell spray foam insulation. Our team will come out and evaluate the best solution for your needs and budget. Attic Solar Fans : Enjoy longer roof life and a cooler home with an solar attic fan. Solar attic fans can help you lower your attic temperature by using the energy of the sun. A solar-powered motorized fan moves the hot air out of your attic so your home stays cool, even during summer months. Attic Tents : Attics can get very hot, very quickly. The hot attic air can seep down through your attic door and increase the ambient temperature of your home. This forces the air conditioning system to consume more energy. Attic tents can reduce this transfer of hot air by 71%. Radiant Barrier Foil : One of the most widely used forms of radiant heat barriers in the country. Radiant barrier insulation foil is very affordable and generally can be installed in about one day. Radiant Barrier Spray : Often used with radiant barrier insulation foil, radiant barrier spray can be applied on uneven roofing structures and irregular attic beams. Because it is sprayed, it can reach even the trickiest nooks and crannies. Radiant barrier spray is also very useful if you’re just not ready to have anything stapled, installed, nailed, or laid out on your attic, especially if you have an antique home. Radiant barrier spray is also a cost-effective way to get started in “heat-proofing” your home.